Tracy Ehrenberg was born on the south east coast of England, in the seaside town of Brighton. At nineteen years of age she landed a job in the Canary Islands (Spain), where she met Marco Ehrenberg from Mexico City. After whirlwind romance of five days, she accepted his marriage proposal and moved to Cabo San Lucas, Mexico to help him take over the family business of three small sportfishing boats. 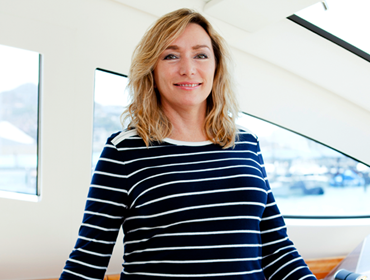 Tracy became fluent in Spanish and quickly learned about boats, fishing and how to run a fleet. Her dedication to service quickly allowed the fleet to grow not only in size but in range, to what it is today; a fleet of fishing boats and cruising yachts, that depending on the season, can be as many as thirty vessels. Tracy has headed up Pisces Sportfishing Fleet for the past 25 years and along with her husband has taken a lead in the conservation of sport fish. In 1995 the International Game Fish Association honored the Ehrenberg’s with the Lifetime Achievement Award for Conservation. Tracy realized that is makes economic sense to protect the fishery resource and use it responsibly. She has also kept accurate records of fishing activity and statistics that is valuable to both the Mexican and international scientists she share it with. Inviting her captains to be part of scientific research in which they have participated hands on with local researchers has been in instrumental in the crews understanding the long term beneficial impact for job security & species preservation, which they are passionate about. Education of both local fisherman and anglers has been an integral part of Tracy’s success in Cabo San Lucas. Tracy is well a respected voice in the fishing community both locally & around the world. Tracy is the go to person in Cabo to get a pulse on what is happening in the local fishery and has been an advisor to Gray Taxidermy for over 25 years as well as successfully pioneering release mounts, with her fleet always being in the top five mounters for Cabo San Lucas. She is known for her integrity, passion and work ethic.